Regular Sizes - NOT TALL / Mens white satin PJ set, long sleeve button front top with matching elastic waist bottoms. Easy care machine washable satin polyester. Medium up to 39 chest. Tall Sizes "click here"
Regular NOT TALL - best looking silk satin red paisley print pajama set. Make a great Fathers Day Gift. Medium fits up to 39" chest; Large up to 42" chest. Regular elastic waist. Easy care machine washable silk satin. Unique stylish one-of-kind Navy White retro checkered unisex print in best quality flannel for very cold days. Great gift for men & women. Match as his hers or purchase one set. Full length elastic waist bottoms, button front collar top. Machine washable 100% cotton, 32-38 inseam. lock in the rich colors. Long sleeves, button front shirt style, full length elastic waist button fly bottoms. Blue navy red white stripe shown above. Tall Sizes "click here"
waist & matching robe. Machine wash dry satin polyester. 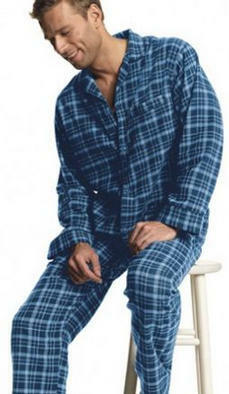 Tall Sizes "click here"
REGULAR & TALL PJ set of rich shiny satin fully backed soft cotton flannel for warm cozy feel.Shirt w/collar, full length elastic drawstring waist bottoms. Machine washable satin polyester cotton. Above in Lilac, Silver Blue, Black, Ivory. All have contrast white or black collar piping. "Please Read" or See Womens PJ. Mens Regular NOT TALL - Best seller gift for men and boys. Long sleeve satin wrap robe, belt and matching satin boxer shorts. 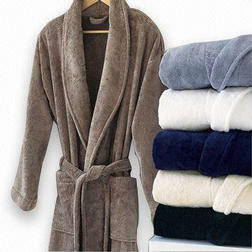 Machine washable satin polyester. Shown above Red, Black available upon request. In Regular Sizes - NOT TALL / Now On Sale! Best Deal 4 pc for $58. 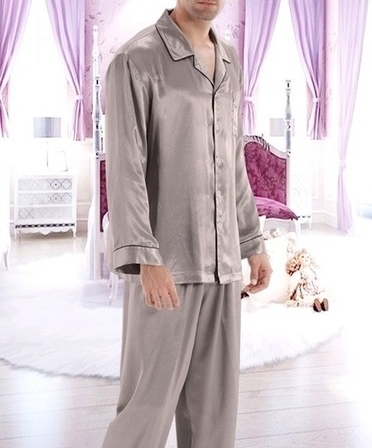 Set includes mens elastic drawstring waist bottoms, ladies chemise with matching kimono robe & satin padded hanger. In Red or Black. Easy care machine wash and dry polyester satin. "Click here See Red!" Best gift for men, boys and plus sizes up to size 2X. 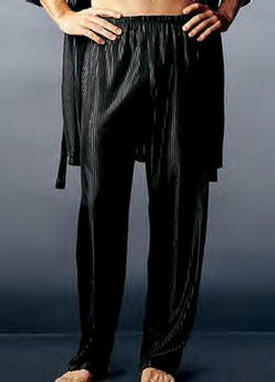 Long wrap belted side pocket satin robe. Measure top shoulder to floor for best length. Machine washable satin polyester. Above Red Black. Tall Sizes "click here"